Albanian Prime Minister Edi Rama said yesterday (18 February) his country and Kosovo could one day have a single president as a “symbol of national unity” between Tirana and Pristina. 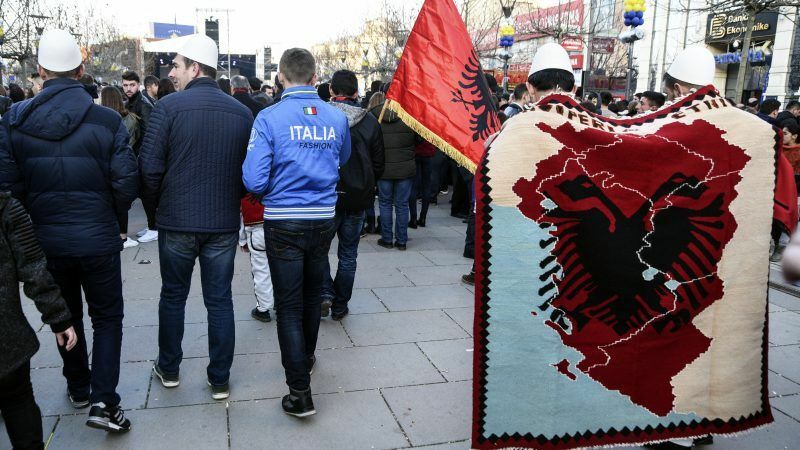 Serbia has repeatedly accused Tirana of wanting to build a “Greater Albania”, an aspiration it denies. In 1998, a war broke out between Kosovo’s ethnic Albanian rebels and Serbian troops that left 13,000 people dead, most of them Albanians. Belgrade withdrew its forces the following year after a NATO bombing campaign against Serbia. Kosovo subsequently became a United Nations protectorate and, with the support of Washington and other Western powers, declared independence from Belgrade on 17 February 2008. “The state of Kosovo has upheld the people’s demand for freedom,” Prime Minister Ramush Haradinaj said in a special government session in Pristina on Saturday. But “we are aware that citizens’ expectations for a modern state have not yet been fulfilled”. Sovereignty is rejected by Russia, whose Security Council veto prevents Kosovo from joining the United Nations, and five EU countries: Spain, Greece, Slovakia, Romania and Cyprus. Kosovo’s unemployment rate of around 30% — and 50% among young people — has led tens of thousands to move abroad in search of work over the past decade. In the Serb part of the divided northern city of Mitrovica, black-and-white posters appeared on Saturday lamenting “10 years of occupation”, with pictures of hands in cuffs. The “normalisation” of ties between Belgrade and Pristina is crucial to both sides’ bids to join the European Union. The former foes have reached deals on issues such as freedom of movement since EU-brokered talks began in 2011, but the dialogue has stalled over the past two years. “Despite the great support it enjoys from Western powers, Kosovo is far, far from being recognised,” said Serbian Foreign Minister Ivica Dačić. Despite Belgrade’s uncompromising stance, just a few dozen protesters gathered in the Serbian capital on Saturday to rally against Kosovo’s independence, in contrast to frenzied demonstrations 10 years ago that left the US embassy in flames. Some officials in Belgrade have raised the prospect of redrawing borders along ethnic lines. But Kosovo’s President Hashim Thaçi insists that the country is “indivisible” and many fear a partition deal would destabilise the fragile Balkans. US President Donald Trump sent his congratulations to Kosovo for making “great strides in strengthening its sovereignty and multi-ethnic democracy”. “While more work must be done, we applaud your progress,” he said. Kosovo’s ties with the West have at times been strained over the past year, as it awaits the first indictments from an EU-backed war crimes court trying members of the 1990s Kosovo Liberation Army. Recent efforts by ruling coalition MPs to block the tribunal sparked strongly-worded warnings from the US and other Western allies.